Located in Dalmatia, Split is the second largest city in Croatia after Zagreb. It was built on a peninsula along the Croatian Adriatic coast and is discovered best by rental car. Its old town has been an UNESCO World Heritage Site since 1983. Compare the offers of car rental companies in Split on Driveboo and book a cheap rental car in Split by using our online platform. As Split Airport (SPU) is only about 25 kilometres from the city centre, it is worth considering one of the many rental car offers right there. That way you won`t depend on public transportation and you can drive to your hotel by yourself. If you arrive in Split by other means, there are also plenty of other rental car stations around the city. On Driveboo you can compare the prices of the rental cars and book you favourite one online in advance. Is there a toll in Croatia? In Croatia there is no vignette required due to the motorway toll regulation. However, if you want to go on a road trip by rental car beyond the national borders, you should note that both in Slovenia and in Austria there is a vignette requirement. Where can I park my rental car free of charge in Split? Parking your car in the center of Split will be problematic especially during the high season. Due to the prevailing traffic chaos, we recommend parking the rental car outside the center. In Zvonac, which can be reached through the Marjan tunnel in just two minutes, you will find a large free parking lot. Parking is also possible in the streets around the center. During working days you can park your rental car in those streets for 5 Kuna per hour (Monday - Friday: 7-19, Saturday: 7-14). There are also numerous car parks available for 15 euros per day. What are the speed limits in Croatia? The beauty of Dalmatia and Croatia is best enjoyed together. Most car rental companies offer the option of registering an additional driver. That way not only your passenger but also you can enjoy the breathtaking landscape if you take turns in driving. The car rentals usually only take a small fee per rented day for this option. In order to find offers that already include an additional driver free of charge you should compare them in advance. Breakdowns not only occur in your homeland but also abroad. In the unlikely event of a breakdown, the road guard of the Croatian automobile club HAK is available for you around the clock. Just dial 1987. For ADAC members there are blanket fees for the assistance. For ADAC Plus members, the journey to and from the location is free of charge up to 20 km and the breakdown service up to 60 minutes. Due to the fantastic location of Split at the Adriatic coast and the Mediterranean climate, a visit is worthwile all year round. In and around Split, pleasant summer temperatures are already reached in April. The bathing season is officially opened in May. Therefore, the months May to October are ideal for beach holidays in Split. If you prefer doing sightseeing, travel to Split in the off season in order to avoid the very hot temperatures. What is there to explore around Split? In the north and east Split is surrounded by mountains. If you are up for some hiking adventure, get in your rental car - an SUV at the best - and enjoy a day in the mountains. Besides the beach and good weather, Croatia is rich in cultural heritage. Therefore visit the city of Salona, where the oldest Marian shrine and the youngest population of Croatia are located. Especially the ancient cities and the beautiful nature are worth seeing while in Croatia. 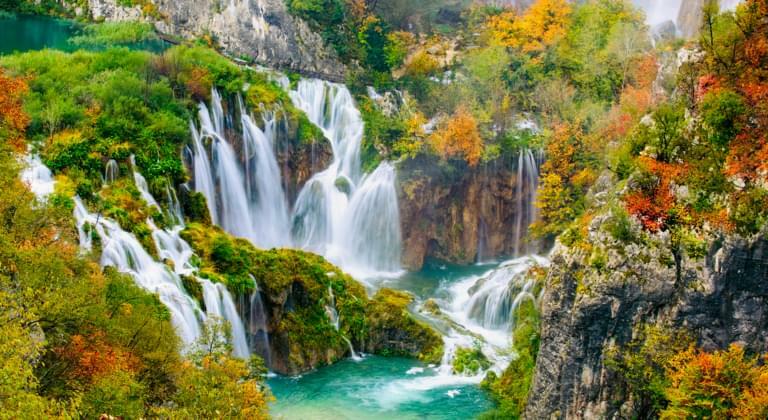 You can also admire the waterfalls of Krka with the famous travertine cascades in Krka National Park. Croatia's islands are easy to reach by ferry from Split. Park your rental car near the harbour and take a trip to one of the islands. Discover the coast of Croatia and drive to other beautiful places such as the city of Zadar Enjoy your trip to the Adriatic coast!